t is with great pleasure that I introduce myself as the new editor of ArtSpace. I feel incredibly excited to embark on this new adventure of learning more about the art scene in Leamington and its many artists. Welcome to our special twentieth anniversary issue of ArtSpace dedicated entirely to our members’ work. We would like to thank each artist for their commitment to this project – ArtSpace certainly would not be the same if it were not for the dedication and support of our members. For your convenience, we have arranged entries in alphabetical order. Furthermore, the names in bold found on the last page of this issue indicate the members whose work is featured in the previous pages. 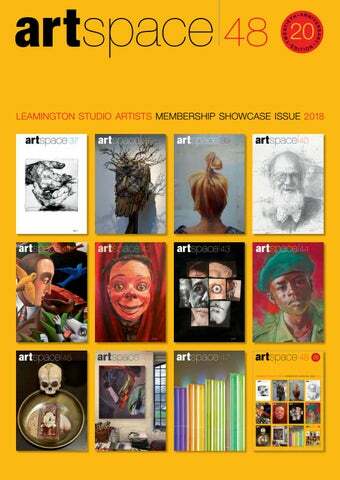 Leamington Studio Artists is a charity founded in 1998 with the aim of providing the many artists of Leamington Spa with an opportunity to exhibit their work. ArtSpace was envisioned as a journal to help LSA realise its vision of promoting the work of its members and informing its readers of the art scene in the region. As LSA grew, it found accommodation and exhibition space in the North Hall, Spencer Yard and then moved on to the Old Art Gallery and Art School, Avenue Road. Later LSA moved into Regent Court, by the Town Hall, in the centre of town and more recently East Lodge in Jephson Gardens has become its base. Issue 34 of ArtSpace was the first produced in full colour, increasing its scope and appeal. The ArtSpace editorial team is delighted with Clive Richards’ design concept for marking this important twenty-year milestone with an issue that showcases exclusively the work of members. 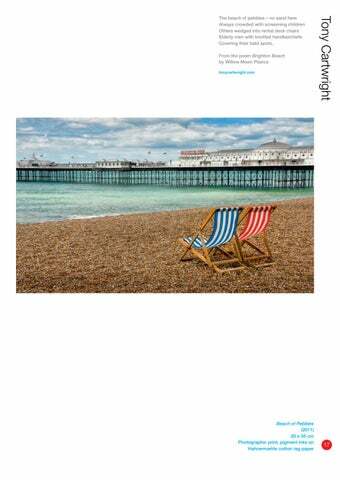 We have been overwhelmed by the fantastic response to our call for entries and we hope readers will enjoy looking at the work exhibited in these pages as much as the ArtSpace team has enjoyed receiving it and ‘hanging’ it in the ‘gallery space’ that is this issue. Thanks are due to Tony Cartwright for providing his photographic skills in capturing for reproduction many of the exhibits on show here. Acknowledgement is also due to Malcolm Waterhouse who continues to provide on a pro bono basis the pre-press digital expertise of his firm, Magenta, a service necessary for delivering the high production values so often admired in ArtSpace and especially well demonstrated in this issue. We were extremely pleased with the enthusiasm members expressed for the approach taken for this special edition and would like to mention that we consider the potential of producing such an issue on a regular basis. We would be most interested to hear from LSA members any reflections on this special issue and whether the opportunity to showcase work in similar style in future publications would be welcome. As always, we would also welcome ideas for articles and reviews of exhibitions, so please do not hesitate to get in touch with me at the email address provided below. I hope you will find this special edition of ArtSpace exhibiting the creativity of our members inspiring and enjoyable. Erratum The ArtSpace Editorial Board apologises that in the article on page 4 of ArtSpace 46 the LSA Open Photography exhibition images Floral Delight and Digital Cameo should have been attributed to Jane Michelle Adams, not Jane Michelle Williams. I create elegant sculptural art forms, bespoke trophies, and centrepiece lighting – for company boardrooms, private clients’ homes and offices. My pictures are my own interpretation of flora and fauna, original drawings enhanced with beads, feathers and a touch of colour. Some pieces are available as prints now and greetings cards but mostly framed originals. Folly Garden artwork has evolved through the love of nature observed in my garden and the wild. It can be angry or still yet we play in it and on it, fish it, and travel through it. However, when it lifts up its voice, we had better beware of it! I had such fun painting this. After all, the ocean is fascinating, vast and powerful, who can tame it? This was painted in a workshop led by Ashley Hanson where we took a Diebenkorn painting as a starting point for further exploration and the development of a companion painting. The beach of pebbles – no sand here Always crowded with screaming children Others wedged into rental deck chairs Elderly men with knotted handkerchiefs Covering their bald spots. An Apple A Day series – a social diary of current affairs on 365 sculpted ceramic apples. Each apple is given a name, some apples are merely decorative, others are topics of global politics and pop culture. Forty of her apples received a joint 2nd place in the 2017 International Arts & Crafts Design awards. Hong Kong born, Warwick-based ceramicist, Jenny’s work is one-of-a-kind decorative pieces. Her work is detailed and delicate. This is the 3rd image from the ‘toadstool’ range. Filled with hidden objects as usual! This painting explores my memories of and relationship to my father who died when I was 8 years old which is now 54 years ago. Also I suppose, I was thinking about his relationship to me as his first born and his feelings towards me. I have worked from a black and white photograph. Usually my work is more abstract and is inspired by flowers and is about colour, pattern and the actual process of painting. So working from photographs is a new departure for me. Jane is self-taught. She works in mixed media including collage and likes taking risks in her approach to her work. Painted in a mad moment with my knife which was the perfect width for the tall narrow buildings, then add the water line then repeat upside down et voilĂ . This picture was selected for the 2018 Columbia Threadneedle Prize and exhibited at the Mall Galleries 31 Jan–17 Feb 2018. Deliberately ambiguous in intention, the image of the girl covering her face is an image of vulnerability and although the title alludes to sadness, it might also be read as an image of someone laughing or in a state of euphoria. Weeping Woman was in part inspired by the painting by Picasso of the same title: Weeping Woman. Paris, October 26, 1937, oil on canvas (60 x 49 cm) Zervos IX, 73. Private collection, England. Being an encaustic artist means I paint with beeswax (used over 2,500 years ago) my basic tools are a soldering iron (called a stylus) and tips I have bought or made myself. I paint on canvas, glass, wood, card. My work uses a technique based on Freudian psychoanalysis. I donâ&#x20AC;&#x2122;t subscribe directly to Freudian theory but I use the free-association process as a way of externalising material that allows chance and accident to occur. Overall, the context and method are controlled but within the general process I try to find a balance between randomness and control that transfers much of the meaning or interpretation to the viewer. Put crudely, itâ&#x20AC;&#x2122;s serious doodling with a purpose. I love the learning process, to create something that is absolutely unique is amazing. Art is a passion which we will have for the rest of our lives and for many it is their life.Â Keep Art in your heart my friends. Many thanks to LSA for your devotion and your inspiration. merely as a means of exploring the tricks of memory and recall. They have a compelling quality that draws you back again and again. Mo Enright’s work has received many prizes and awards and can be found in collections in England, Ireland, Scotland, Wales, France, Germany, Canada, Australia, Ethiopia and Russia. This painting deals with the plight of the Monarch butterfly. in Mexico has reached its lowest level in two decades because of illegal logging of the Oyamel trees. The Oyamel is a major species of evergreen on which the Monarch butterflies spend approximately four months overwintering. They migrate to the very same place and the very same tree as their greatgreat grandparents did before them. Mo Enright is listed in Who’s Who In Art. Please visit the website to find out about other galleries, exhibitions and reviews. Twisted Rose is the first in a series of paintings being created by Andy Farr. Each will be inspired by a personal account of post traumatic growth. Supported by Arts Council England, the first exhibition of these paintings will be at the Institute of Mental Health, Nottingham, in September and then on tour through 2019. Some of the works will be on display in Andy’s Studio as part of Warwickshire Open Studios. Painting is a driving force of physical engagement. A spontaneous combustion, deeply inspired by listening to modern jazz. I am drawn to expressing places where the light and colour interact to provide beauty â&#x20AC;&#x201C; wide expansive skies, the hues of nature, reflections in water, textures and layers. I love how colour can be built up and blended from its constituents. Working with oils, you can create the depth and levels of colour, constantly blending and mixing the paint to produce the hue and texture needed. I was introduced to David M Martin’s work by Phyllis Davies, and this is the second multi-viewpoint table top I’ve done. Now aged 95, he has rather more experience (and skill) than I have, but they’re an interesting challenge to undertake. The theme of the sculpture is about the emotional turmoil of a young male and the acceptance of responsibility, fired by marriage and parenthood. The top of the sculpture shows parents and child, below depicts in abstract form confusion. Human and natural forms dominate my view of sculpture, speaking and listening shows how we relate to a wider sculptural world. As we observe and touch these forms we are encouraged to think as a sculptor, communicating with chisel and mallet or by word and pitch. We all need a platform to speak from that relates to human and natural forms. Through meditation, mindfulness and spiritual awakening souls recognise their inner light and move into it. Letting go of fear, judgement and resentments, truly seeing the beauty our Universe presents. Taking conscious actions with the energy of love and gratitude shaping positive, magical outcomes: affecting others, sweeping them along on the vibrational shift. The faces in the painting represent the souls coming into the light. The background depicts energy and vibrations surrounding them with vivid vitality. Within the vibrations are shapes/figures of others being swept along on these vibrations of love and gratitude; from those who have come into the light and are consciously living in the here and now. Consciously present, alive to the now Overflowing with love, compassion and joy Presently filled with peace and gratitude Consciously present, enjoying the moment. I’ve recently started being represented by the Portside Gallery in Bristol and have relished tackling new subject matter such historical boats and dockside paraphernalia. I am a Leamington based artist whose overriding passion is the world of Art. I enjoy working with other artists, encouraging them along their creative journey and helping them to promote their work. Red Sky, painted in summer 2017, is based on a scene from the tiny island of St Agnes, Isles of Scilly, where there are no roads or street lights. Surrounded by the Atlantic, with its seabirds and seals, with big skies, one is very close to the elements, in touch with the awesome power of nature, and also its vibrant tranquility. It is this latter feeling that the painting attempts to convey. The Red House suggests a fairytale enchantment, but with a subtle sinister undertone of what might be hidden. This original oil painting won first prize in the Rugby Annual Open 2017. Bryan works from his studio in East Lodge, Leamington Spa. mythological and ritualistic themes. Drawings such as Paris, Adam and Narcissus conjure up mythical associations and narratives while remaining both archetypal and universal in their character. Â The new drawings show that Alison has continued to extend her familiar imagery while enriching the context within which her figures are located. She has also continued to intensify the physicality of her drawings along with the distinctive torn and fragmented surfaces which have always been a defining feature of her work. Alison Lambert is considered one of the foremost British figurative artists with recent works added to collections of the British Museum, V&A Museum, Pallant House and the Minneapolis Institute of Art. Â The new drawings continue her intense examination of the isolated human head, while adding suggestions of background landscape forms. These background features provide additional elements of location and a sense of mystery and ambiguity. The same year, he received the NS MacFarlane Charitable Trust Award (RGI) and was also shortlisted for the DLA Award (Sarah Myerscough). Following a BTEC National Diploma UCE Birmingham in 1998 Nick Logan acquired his BA (Hons) in Fine Art â&#x20AC;&#x201C; Drawing and Painting at the Glasgow School of Art in 2003, with a sell out degree show. Dynamic, textured, colourful and varied, his preferred medium is oil painting, with a key focus on interiors, landscapes and portraiture. April 2017 was an amazing month in Cornish woodland. The buds on Beech and Birch trees seemed to be even more beautiful than usual. Their shape, colour and marking were beguiling and entrancing. I found myself drawn towards them week after week in an effort to capture the fascination I experienced. This image is an impression of my reactions rather than a literal representation of the subject. Aspects of my work are becoming more abstract. My growing interest in shape and colour, almost regardless of the subject, is clear to see. Technique – 3 images blended together including one (Alexander Plant), with some Intentional Camera Movement (ICM). Emergent: Adjective – in the process of coming into being or becoming prominent, beginning, arising, dawning, budding, promising, potential. Her works are for sale and she takes commissions. View with Asters was created in July 2017 and was part of the Warwickshire Open Studios exhibition at Upton House. Lis has a diploma in Art and Design and Textiles and a BA (Hons) and MA in Fine Art. She is a multimedia artist who, alongside other mediums uses textile, paint and clay to create 2D and 3D works. Her Art Pieces are in collections in the UK and abroad. My subject matter is wide, rich and varied. But one requirement it must possess is – ‘attitude’ or ‘quirkiness’. This I found in abundance when I started working with The Knights of Middle England, a leading jousting team, they re-enact history and perform far and wide, including Warwick Castle. They are vibrant and most important to me; they ride beautiful horses [I love horses!]. I use the history, the armour, the drapery, the elegance, the pageantry, and the landscape in the same contemporary way they perform. This work is inspired by one of my photographs which I took last summer and was in the recent Open Photography Exhibition. This was painted in St Ives a couple of years ago when I was going through a brief Fauvist phase. In 2000 I was lucky enough to have the opportunity to be a student on an art course with Neil Moore as my tutor before completing a fine arts degree at Birmingham City University. This followed with various commissions for portraits and figurative paintings which I fitted in whilst working in an art gallery. However a few years back I began to create textured city and seascape paintings which I exhibited and sold in galleries in Newcastle, Chester, Stratford and London. More recently I am experimenting with contemporary portraits which I am hoping to evolve to a style that, whilst enjoyable to create, also challenges and pushes me to develop further. I’ve always loved experimenting with drawings, colours and textures. I mainly paint landscapes, and this one reflects my familyâ&#x20AC;&#x2122;s fascination with ley lines when I was growing up in Wiltshire! Odd, but true. Kevin is a fan of the science fiction/fantasy TV programme called Doctor Who. My work is inspired by my love of the natural world. “Some say that love’s a little boy, And some say it’s a bird, Some say it makes the world go round, And some say that’s absurd, …When it comes, will it come without warning…Will it come like a change in the weather? Will its greeting be courteous or rough? Will it alter my life altogether? O tell me the truth about love.” W.H.Auden The painting is an evocation in visual terms of the poem, of which I have quoted a few lines. It springs from the happiness which suffuses Royal Leamington Spa, the happiest town in England, according to a recent survey. and accompanying emotions in my life. My sources of inspiration generally come from abstract and surreal artwork, predominantly executed in acrylic. Life taught me lessons, and in my painting State of Mind I am trying to preserve a specific experience, a site of private memory and allusions. I didnâ&#x20AC;&#x2122;t break into painting till quite late. The peace and mediation it gave me was a blessing, hence this painting of The Twins. Painter textile artist and illustrator creating calming works inspired by natural forms found in British landscapes, seascapes, floral meadows, rocks and coves. Cathy specialises in acrylic painting, silk painted textiles, quilting hand and machine embroidery and has designed and illustrated several educational colouring books. A worker who currently focuses almost exclusively on COE90 glass. Influences include modern and contemporary asian art, Japanese microtextiles and also the work of Katie Paterson. I am a self-taught artist who works in oils, acrylic and pastels. I create landscapes, city scapes and seascapes as well as creating portraits! This was going to be a picture of my garden pond, but, whilst the flowers, plants and trees shown were all there, it grew into something far more exotic and dreamlike than the reality. I made the ivy clad tree a strong feature of my painting, as this is the home to many of the birds and squirrels that flit around my garden. The painting is based on a collage of pencil sketches and photos taken at a theatre in Buenos Aires. I identify myself primarily as a painter, although my work often includes other materials, to make more interesting marks, and to take my practice further. I am currently studying for my Fine Art and Contemporary Culture degree as a mature student. This is a really important step for me to achieve a long standing goal, but more importantly to enable me to focus on my search to find something deeper and more personal in my work. Being from Ashington, home of ‘The Pitmen Painters’ I have started to follow their lead, and paint the North East’s industrial past. The challenge for this picture was the fact that the Chateau is completely masked by a row of mature trees, shown in a ghost outline, which made capturing the whole building quite difficult. This is a unique image on glass, using the wet plate collodion method invented in 1851 by Frederick Scott Archer. life images for Open Studios 2017 and subsequently exhibited in Shadow Merchants at Argentea Gallery in Birmingham. A piece of glass is hand coated with a collodion solution which is then sensitised in Silver Nitrate. The resulting glass plate is then placed in a large format plate camera and an exposure made while the plate is still wet. Semi-abstract mixed-media painting of boats moored at a quay in the city at night. Exhibited at the RBSA in 2017. The starting point for this painting was a very much enlarged detail from a chain saw cut on an ancient oak tree stump. Painting is a hobby I have pursued for over 35 years. The enjoyment of creating is immense, and the source of my inspiration is varied. I enjoy working in all mediums, and constantly incorporate new techniques to expand my means of expression. I am an amateur photographer who enjoys taking photographs of mainly landscapes, still life and abstracts but also of any other subjects that take my eye. This image was taken only a stones-throw from the LSA gallery. It is a reflection from a willow tree in the River Leam taken on the 19 January 2018. The image has had very little post process work and cropped to a square format. We had an enjoyable day out at Benthall Hall, Shropshire, and the view from the car park across the open countryside fitted well with my project as set for our art group. I enjoy drawing and have been attending art class for about ten years following my retirement from work. My favourite medium is coloured pencil. Nature, wildlife and trips to far-flung places feature heavily in Cherry’s work, a curious soul she likes to reproduce her work in different ways, this piece is part of her Azores series on aluminium panels. A writer, her photography predominately appears in magazines alongside her articles. This year saw her photography and poetry in the recent Look exhibition at East Lodge and a book of photography and poetry produced in collaboration with fellow poet Clay Lowe is to be published this year. Always known as ‘Black Bridge’ Whitnash, happy hunting ground in the 1950s, train spotting, girls, long summer days. I taught myself to paint many years ago. I have successful results and sometimes I don’t, but I never give up. Keep painting. he Leamington Studio Artists exists for the benefit of the local community by promoting and fostering the interest and appreciation of all forms of the visual arts in and around Royal Leamington Spa. The Society is committed to assisting its artist members by encouraging professional practice and organizing visual art exhibitions, events and other opportunities for the general public to experience their work. We encourage and support local arts events and showing our members work at local galleries thus providing access to art for all. We also aim to advance the visual arts by providing and managing personal studio spaces for local artists at a reasonable cost. We aim to provide educational and gallery space within our organization in order to persuade local artists of distinction, as well as our own members, to run arts courses and exhibitions available to all. We publish our highly regarded journal ArtSpace, the content of which features articles on the work of individual members, reviews of local exhibitions, book reviews and news about the art world in general. Join us and share our passion for art LSA’s membership embraces artists working at all levels, from talented professionals to beginners, and in a variety of forms: painters, sculptors, potters, photographers, textile artists etc. We welcome new members whether artists or those who are just interested in art. If you would like to become part of our artistic community and are willing to participate in voluntary activities such as spending time running a gallery, writing for ArtSpace, helping to organize events or just supporting our cause, then please join us.